It was a two-day conference, but it perfectly encapsulated the grand vision for the Phil and Penny Knight Campus for Accelerating Scientific Impact when it opens two years from now. Genomics in Action brought together graduate students enrolled in the Knight Campus Internship Program with leaders of industry and academia earlier this month at the Ford Alumni Center. The students got to hear about cutting-edge research currently underway in their fields, as well as have the opportunity to network with speakers and share their own personal research during the conference’s poster session. More importantly, the internship program let students interview with representatives from many of the companies and institutions in attendance with the goal of landing an internship with one of them. And chances are they will be successful in that regard. The Knight Campus Internship Program, which officially launched last year, united the longstanding and successful materials science Master’s Industrial Internship Program and the Bioinformatics and Genomics Master’s Program to form a single unit. Nearly all of the students who have entered those programs have been offered a paid internship. And nearly all of them have received job offers upon earning their master’s degree. The Knight Campus Internship Program marks the first academic programming of the Knight Campus and serves as a prime example of the mission and vision of the campus as it evolves from big idea into reality. Groundbreaking for the first Knight Campus building is set for Friday, March 2. The students work alongside established scientists at entities ranging from start-ups to Fortune 500 companies and national laboratories with the goal of having the students make meaningful contributions. The program is designed to fuel a cycle of benefits that help students, campus partners and, ultimately, society as they translate scientific breakthroughs into useful applications. The internship program includes several tracks in materials science and a track in bioinformatics and genomics. They all offer intensive curriculums that sharpen young scientists’ technical know-how to excel in industrial and applied research settings, while also giving them the skills required to land a job and excel in the workplace. After an accelerated summer of intensive coursework, participants transition to paid internships, typically lasting nine months. Since 2011, about 75 companies have taken part in the Master’s Industrial Internship Program, hosting 300-plus interns. Ninety percent of program alumni are employed within three months of receiving their degree. The majority of alumni, 70 percent, are hired by their host company. The statistics are similar to the Bioinformatics and Genomics Master’s Program, which launched in 2012. Ninety percent of its 57 graduates also have landed a job in their field within three months of graduating, and many are asked to stay on where they interned. The program’s directors use the feedback from current and prospective labs to guide what they offer to future cohorts of the internship program. Graduates of the Bioinformatics and Genomics Master’s Program earn a master’s degree in biology with a focus in bioinformatics, which combines computer science, biology and mathematics to analyze and interpret biological data. The program gives students the skills to analyze big data, including genomic sequencing — the process of determining an organism’s DNA sequence. The Master’s Industrial Internship Program awards degrees in chemistry and applied physics. Students select one of three focus areas: semiconductor and photovoltaic device processing, optical materials and devices and polymer science. Students from these tracks have a wide array of opportunities to choose from, such as computer chip manufacturing, design of high-powered lasers and enhanced delivery of pharmaceuticals. The academic tracks will be located under the same roof when the first Knight Campus building opens its doors in 2020. Their proximity to new, innovative spaces and core facilities will provide opportunities to expand upon an already-strong portfolio of programs into new areas. 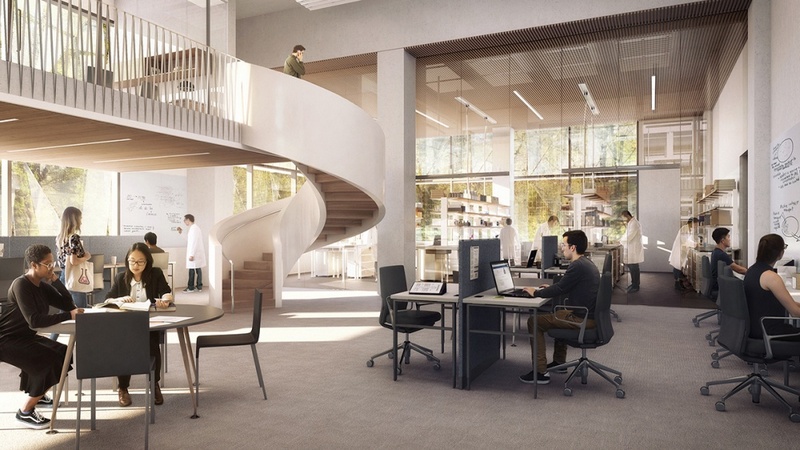 The building will host laboratories and classrooms designed specifically for applied graduate education as well as spaces industrial partners can lease to further accelerate collaboration with faculty and students. Another aim is to develop the next generation of scientific leaders, who will help extend the reach of the Knight Campus.